Kick off your visit on the 26th (Mon): hunt for treasures at Hakaniemi Market and then get engrossed in the history at Seurasaari Island and Open-Air Museum. Get ready for a full day of sightseeing on the next day: explore the striking landscape of Nuuksio National Park. For where to stay, ratings, reviews, and more tourist information, you can read our Helsinki vacation builder tool . Berlin, Germany to Helsinki is an approximately 5-hour flight. You can also do a combination of flight and ferry; or drive. The time zone difference moving from Central European Time (CET) to Eastern European Time (EET) is 1 hour. In August, plan for daily highs up to 24°C, and evening lows to 13°C. Wrap up your sightseeing on the 28th (Wed) early enough to take a train to Kouvola. Kouvola is a town and municipality in southeastern Finland. 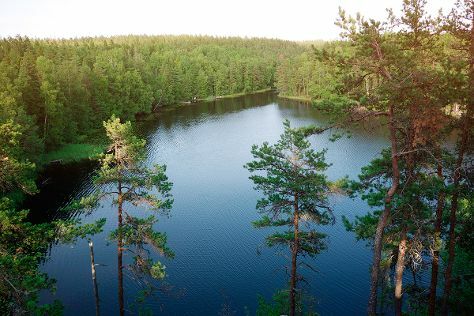 Kick off your visit on the 29th (Thu): delve into the lush surroundings at Niivermaki Nature Conservation Area, then take in the architecture and atmosphere at Pyhan Ristin kirkko, then take in the architecture and atmosphere at Main Church, and finally look for all kinds of wild species at Arboretum Mustila. To see ratings, traveler tips, other places to visit, and tourist information, you can read our Kouvola travel planning app . You can take a train from Helsinki to Kouvola in 1.5 hours. Alternatively, you can drive; or take a bus. In August, daily temperatures in Kouvola can reach 24°C, while at night they dip to 13°C. Finish your sightseeing early on the 29th (Thu) so you can travel to Kuusamo. Kuusamo is a town and municipality in Finland. Kick off your visit on the 30th (Fri): look for gifts at Shopping Center Kumpare, hike along Pieni Karhunkierros Trail, and then take in breathtaking views at Kiutakongas Rapids. Here are some ideas for day two: explore the stunning scenery at Julma Olkky, then see the interesting displays at Hannu Hautala Nature Photography Centre, and then explore and take pictures at Palosaari Reindeer and Fishing Farm. To find reviews, more things to do, other places to visit, and other tourist information, read our Kuusamo trip itinerary builder . Traveling by combination of train and flight from Kouvola to Kuusamo takes 5 hours. Alternatively, you can do a combination of train, flight, and bus; or drive. Traveling from Kouvola in August, things will get little chillier in Kuusamo: highs are around 20°C and lows about 10°C. Finish your sightseeing early on the 31st (Sat) to allow enough time to travel to Tampere. On the 1st (Sun), look for all kinds of wild species at Hatanpaa Arboretum, step off the mainland to explore Viikinsaari Island, and then relax and rejuvenate at some of the top local wellness centers. On the 2nd (Mon), you'll have a packed day of sightseeing: kick back and relax at Rauhaniemi Beach and then examine the collection at The Finnish Labour Museum Werstas. To find maps, traveler tips, and more tourist information, read our Tampere trip builder app . Do a combination of flight and train from Kuusamo to Tampere in 5 hours. Alternatively, you can fly; or drive. August in Tampere sees daily highs of 23°C and lows of 11°C at night. Finish up your sightseeing early on the 2nd (Mon) so you can travel back home.